Since I’ve publicly mentioned some resolutions on the site, I figured I may as well post some periodic progress reports and keep myself honest. The numbers in brackets are ‘new’ people/places/countries (see the rules below). Not a bad start for the first month, particularly since January is generally the month people just sit around and recover from the holidays. Looking back I actually feel like it’s been a month where I’ve done stuff and not just sat of the sofa. Hopefully that gives me a benchmark to live up to for the rest of the year, February is already shaping up to be just as busy. The rules (‘cos there have to be rules). For places and countries the numbers are the number of unique places/countries I’ve been so far this year. The number in brackets indicates the places/countries I’ve never been before. Passing through somewhere due to connecting flights or transfers doesn’t count. For people it’s the number of people I’ve travelled to visit (counting people in Edinburgh only if I make the effort to visit their home). The number in brackets are people I didn’t visit last year and/or would have been unlikely to visit this year if I hadn’t made a resolution to do so. Partners and family members don’t count extra unless I know them separately and “accidents” don’t count, I have to be deliberately going to see the person. February sees the start of “Edinburgh’s very first citywide reading campaign“. They’re encouraging everyone in the city to read the same book (“Kidnapped” by Robert Louis Stevenson) by giving away 25,000 free copies in various libraries from the 1st of February. There’s various events scheduled throughout February that tie in with the book and they’ve also created two new versions a ‘simplified’ version and a graphic novel. It’s interesting to see a literature campaign unashamedly plugging a graphic novel, I’m wonder if a few purists raised an eyebrow at that. I’m not sure if the whole thing will make that much of an impact but it’s a novel (if you’ll excuse the pun) approach to getting the city reading. The cynic in me does wonder if, since the original text is out of copyright, the new versions are just a way of making some money once the freebies run out. Particularly since all the versions are also for sale and there’s two other versions of the graphic novel with the same artwork but different text (one using Scots language and one in more modern text) that aren’t going to be available for free. Still it seems a worthy cause, I’m not convinced it’ll take off but I’ve never read the book so I’m might try and give one or more of the versions a read if I can get hold of a copy. It’s been a interesting, if somewhat hectic weekend. I’ve not really got a lot to say about Dublin, I wandered around visited Dublin Castle, Christ Church Cathedral and learnt a wee bit of viking history. All good places to go, and cheaper than comparable places I’ve been to elsewhere. It does remind me how little I know of both the ancient and recent history of the British Isles. There are, as expected, lots of pubs — but a fair few of them were very much your new style commercial chain pub rather than the old style boozer I was looking for. I found a few to my liking tho’ — not sure I’ll be able to find any of them again. The travel was interesting, thanks largely to the stinking hangover I had flying out on the Saturday. This was thanks to this fiend: and his birthday bash. 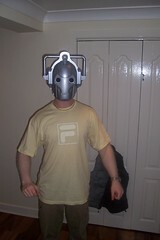 Happy birthday drunken Cyberman! I’m pleased to say airline security doesn’t seem to be holding stuff up much any more, no one more than glanced at my carefully bagged tube of toothpaste. I flew back — with less of a hangover, but early enough to have me up and about at 5am — on the Monday and actually made it into work earlier than I normally would have. Which is pretty impressive since I started the day in another country. I overheard an interesting order while I was waiting for my lunch in the sandwich shop today. I wasn’t deliberately listening but my curiosity was piqued when the lady ordering looked at me in a guilty fashion and then lent right into the counter to whisper her order. I didn’t catch all of it but it seems she wanted a hot sausage roll. On a bread roll. With brown sauce. A sausage roll roll, if you will. There may have been more components that I missed. Sadly I didn’t get to witness the eventual masterpiece as my turkey sandwich and a pie arrived before it was complete. And I thought the deep fried mars bars where the low point of Scottish depravity. I’m only glad that the Americans have already laid claim to deep fried butter. Gah, I just realised that this is a ‘what I had for lunch’ post. I had a rant written out yesterday about the general unreliability of builders. While the bulk of it still stands the venom is somewhat dulled today, as the company in question actually started being somewhat competent and flexible this morning. Of course if they’d turned up yesterday, when they should have, then I’d not have had to get up two hours early this morning. The upshot of all of this is that I now have a hole in my fake bathroom ceiling, revealing a hole in my real bathroom ceiling (and yet another dubious looking wiring job). Hopefully one of the people I’ve had in will manage to grasp that sending me an estimate might be a good idea, a first step to the ultimate resolution of no holes, and less ceilings, and me paying them. To take my mind off ceiling issues I’ve taken advantage of RyanAir’s current “free flights” deal which I found from the, always useful, Cheapflights newsfeed. This time, unlike a lot of their cheap deals, they mean really-almost-free — they even pay the taxes, but only if you’ve already booked with them already in the last fortnight. Although they still charge for checking luggage and for paying using anything that’s not a RyanAir branded credit card so you’re likely to end up paying a few quid a flight. Still pretty cheap. So I’m in Dublin this Saturday night. Groovy. Last year I went to five new countries (I think) and ten new places (although I might be missing some that are closer to home). That’s not even one a month. Certainly something to aim for this year, maybe I’ll tack it onto my new years resolution. The last few years I’ve gone on holiday in February, it gives me something to look forward to during the dull days of January. This year is no exception and so I’m sandwiching a few days in Berlin between visiting friends in London and Oslo. I choose Berlin because it has cheap flights at reasonable times from and to the places I need to be and because I’ve been advised that there’s “lots to do”. I’m not entirely sure what to do, but I’ve got a month of work to surf various travel sites to find things. Suggestions are also welcome. Well the new UnorthodoxY is one year old today (kind of, depending how you measure it). There are currently 109 posts and 34 comments. Not including this post, so that’s around 2 a week which isn’t bad. I started the site as part of my regular January flurry of doing stuff. The majority of those good intentions are normally tossed aside by the end of February so I’m quite impressed we’re still here, posting may have been sporadic but I’ve generally kept it going. I’d expect everything to continue in much the same way this year, hopefully I can find some more interesting content and have to resort to blatant filler less. I must get more pictures sorted out, I’ve tons lying around (in a digital sense) that I’ve not sorted through yet. So to all of you, from those just joining us to those that were here a year ago, thanks for reading. … you just heard is a significant part of my life being sucked into the void that is Celebrity Big Brother. Sad I know. Brief comments after the jump to protect those that haven’t seen the launch show yet. Or those that just don’t care. Edit: Changed the date to push this off the front page due to video player issues. Those looking for deep insight may want to skip this post. Cars: I’ve no idea why I recorded this — I there’s probably something cool that you can’t see because it’s too dark. That’s pretty spiffy, and the process is just press a button, wait, cut-and-paste the result. Nice. Now I’ll have to see if I’ve any interesting videos, or go out and shoot some. You are currently browsing the UnorthodoxY weblog archives for January, 2007.